ITT Night Vision, the world's leading producer of Generation (Gen) 3 night vision devices, introduces the Night Enforcer® NEPVS-14 PINNACLE® Monocular Night Vision Device (MNVD). The multi-functional NEPVS-14 light-weight, single-battery, battle-proven design features the latest auto-gated, thin-filmed PINNACLE® image intensifier tube technology as well as variable gain control allowing the user to increase or decrease image tube brightness for greater image contrast in varying light conditions. Designed for the most demanding night time law enforcement applications, the NEPVS-14 can be handheld, head-mounted, helmet-mounted, weapons-mounted, and adapted to a camera or camcorder. Morovision Night Vision proudly offers the NEPVS-14 First Responder's Kit. Equipped with a factory new, high-performance, ITT Generation 3 PINNACLE® image intensifier tube, the NEPVS-14 night vision monocular device is designed for the most demanding of night time applications. Lightweight and versatile, the NEPVS-14 monocular, featuring PINNACLE® technology, can be hand-held, head-mounted, helmet-mounted and weapons-mounted. It is also camera and camcorder adaptable. 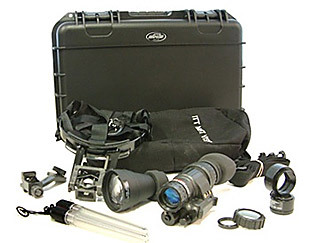 First Responder Kit additional accessories include: Demist Shield, Sacrificial Window, Magnetic Compass, 3x Military Magnifier Lens, (2) IR Laser Sticks - Dual Function, and a SKB Mil-Standard Injection Mold Case. The MV-300 Generation 2+ is one of the most powerful and versatile night vision systems in our product line. 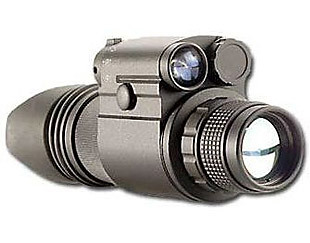 A long list of standard features are packaged into a compact and rugged housing including; a high-power multi-stage infrared illuminator, Mil. Spec. 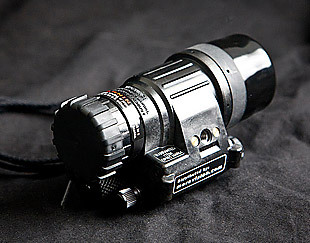 optics, and an internal low battery/infrared indicator. With an extensive variety of optional accessories including headgear, camera/camcorder adapter, and magnification objectives, the MV-300 can be easily configured for any mission requirement. Using a high performance ITT Generation 3, 64-72 lp/mm image tube, the newly designed U.S. Military battle-proven MV-14 Ultra provides exceptional quality image resolution under varying light conditions. The innovative mil-spec housing is extremely lightweight, weighing only 9.2 oz and can be submerged to depths up to 66 feet. The MV-14 Ultra operates using either one AA or one 3V lithium battery and includes a built in IR Illuminator for increased image clarity in low light situations. Standard accessories including a head mount assembly and a weapons mount make the versatile MV-14 Ultra required gear for all public safety and military applications.